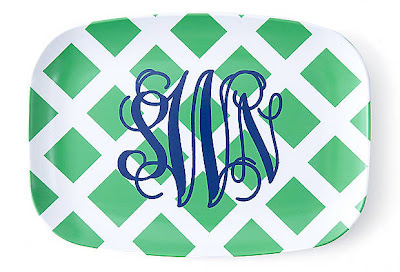 Today's giveaway for the 12 days of Christmas is this delightful Preppy Plates large platter. The melamine platter measures 10" x 14" and is a chic addition to the preppy table. The blue and green palette matches any preppy decor. It's perfect for entertaining and would look perfect at your next party. New and current blog followers are eligible to win this giveaway. You must be a blog follower in order to win. To enter the giveaway, use the widget in this post and leave a comment below this blog post to tell me about your best holiday entertaining tip. There are many ways to enter to win! The contest ends on Wednesday, December 28, 2011. The winner will be announced 48 hours after the end of the giveaway. Do as much as you can before hand so that you can enjoy the celebration with your guests and not be in the kitchen. A holiday tip if you aren't entertaining is to offer cleanup assistant to the cook. Even though they may not need it, I always find it to be a nice gesture. My biggest tip would be to provide festive favors, that are both cute but practical. Also, it is important to make a good impression from the get-go, so I would recommend a cute set up in the walkway of your house. For example, on our white columns, we have garland wrapped around them and we have little festive things near the front entrance. Too cute! My best tip is not to stress, you want it to be fun for you too! Love the platter!! A couple holiday tips I've found useful are a) make lists, b) put on a fun playlist while doing things like dishes, cleaning the house for company, etc. and c) set your table the night before- it reduces the stress on the day of the event! My best holiday tip would always be to over prepare with regard to food and beverages. You never want to run out! my tip is to always be conscious of those on special diets (vegetarian, gluten-free, nut allergies etc) by having a variety of foods and allowing your guests to add things like sauces/condiments on the side! As someone who despises mayonnaise, this is something I wish more people would embrace! Need this platter! My best tip is to ask for help when needed and not stress. Everything will be great! Holiday Tip: I always have plenty of disposable containers to give my guests leftovers from my holiday get-togethers!! What a super giveaway, I just love the platter!! I always make sure that my guests leave with a little sweet something to remind them of their evening with us. Whatever main dessert is on the menu, I make sure that extra has been prepared or purchased and packaged beforehand in festive favor boxes that my guests can take home with them! My guests always leave with a delightful smile on their faces when they have their little boxes in hand at the door!! Great giveaway! I'm really enjoying all the tips people are leaving. My tip would be to make arrangements to have your pets elsewhere for the evening. Not all your guests like your big golden retriever knocking over their wine glass or stealing their nibbles. I've learned this the hard way and now leave my monster dog out of the entertainment area :). Great giveaway! The one thing that works best for me is Lists..lots of lists. Keeps me sane and organized. Merry Christmas! get great ideas from pintrest and blogs and do as much as possible before hand, dont get stressed out, everything will pull together just fine!! My best idea is start a board on pinterest and collect all your ideas. It helps to keep focused. Also make things but cheat some things with cool store bought things from Trader Joes. Wow! So cool! I'm not entering my own giveaway, but just wanted to leave a comment because these ideas are fantastic, particularly the one about saving images on a pinterest board. My best tip would be try and make dishes you can make the night before or ahead of time, one less thing to stress about. my best tip is to plan your menu ahead of time and choose dishes that can be prepared ahead of time. if all else fails, have lots of wine on hand! always prep the night before :) thanks for the opportunity! When having a holiday party I select a cute theme, provide desserts and drinks, and all my guests bring yummy appetizers! All while wearing my Lilly Pulitzer apron!! When having a sit down dinner, use place cards and assign seats. If you know who sits together better, it will make the sit down less stressful and fun for everyone! mbonvino16 ~ A Lilly Pulitzer apron!?! Swoon! Where on earth did you find such a wonderful item? I prep all my soups long in advance and freeze, I also make pastry as far in advance as possible! My mother always tells me to have candles on hand. Stick them in the bathroom, hallway and other unexpected places that are not always lit up. It creates such a nice cozy atmosphere that most people don't expect. Always make sure to send thank you notes and I use index cards to assign all the platters/bowls food items the night before a party! For favors for guests- I use last year's xmas card that was sent to us and cut out the family picture and put it in an ornament frame to give for their tree- guests love this! My best tip is to plan ahead and stay on top of the party. Keep the glasses full and guests happy! my best tip- label EVERYTHING you put out. it makes you a much better hostess when people do not have to hunt you down asking info about each dish or drink! Collect a variety of neutral serving pieces that work for all occassions and add some color with a few holiday appropriate pieces-red for the holidays, pastels for spring time, etc.! Such a fun giveaway! I did a post today on one of the most important things to do around any holiday--write thank-you notes. I try to keep it casual om Christmas Day. Christmas Eve, we open matching pjs and are required to wear them all the next day. When the rest of the family arrives they too, must wear their pjs. No itchy, fancy dresses for the little ones. It just makes the day more fun and comfortable! Try your best to focus on the true spirit of the season! I always have cookie dough in the freezer so I can pop in a few cookies whenever I am returning a plate that had goodies for me! I plan ahead and take inventory of what I need. I make a few appetizers and buy a few appetizers. There's no need to wear myself out. If I'm stressed, then my guests will be stressed. My best tip is always make sure you have enough food for your guests! You never want to run-out!